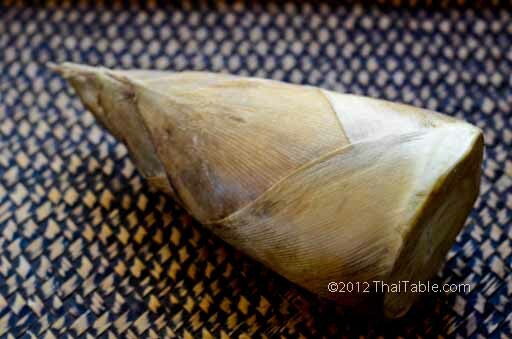 Fresh bamboo shoots have been available at Asian markets now for a few years. They are the actual shoots that come up from the ground next to the parents' trees, similar to asparagus. Some shoots are even hidden underground but bamboo shoot experts always find them. They are 3-5 inches in diameter at the base, no more than 7 inches tall. The shoots that are available in the US are smaller and more yellow than the ones in Thailand. The flavor and texture are very similar, sweet with light yellow crunchy flesh when cooked. In Thailand, at my grandparent's house during bamboo shoot season, the carving, preserving and packing was a miniature assembly line with a small group of ladies. They'd first peel the shoots into blocks. From the blocks, these ladies would delicately carve butterfly, rabbit, flower, petal and other beautiful figures. Then each carved block would gets thinly sliced into 2 dimension figures. The beautiful carved pieces then go next to the packing and preserving stations where they're canned in jars. During New Year, these jars of preserved bamboo shoots become homemade presents for my grandparents' friends and relatives. Carving out the bamboo shoots is not as hard as I'd thought. I pick a metal cookie cutter the size of the bamboo block, press down hard to cut the block all the way through. Then slice it thinly to get the thin pieces of bamboo for soup and curry. There's more waste than doing it manually, but it's still fun.